Another night of so so seeing in my front yard, but I was able to catch this image of Jupiter with its Great Red Spot and Great Red Junior. 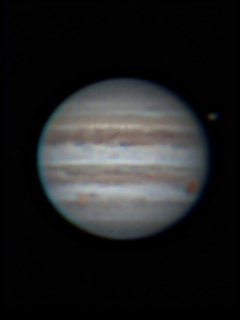 The Great Red Spot is on the lower right limb while Great Red Junior is in the lower left a little less than a quarter of the way in from the edge. Processing This image was processed using PIPP and Autostakkert to produce the image file from the video input. The rest of the processing was done in Images Plus. Since the seeing was poor the sharpening was not pushed too much resulting in a somewhat washed out image to keep the noise down.